SAP and Big Data is always a bit entertaining to me, maybe because I have been around SAP applications so long and associate SAP typically with a company’s core business functions. Sure, they create a lot of data but not to the degree that you can call it Big Data. So, although we can observe a lot of new developments, SAP and Big Data today are really two different worlds; at least two data sets, two or more type of platforms, a variety of technologies, and a number of skill sets. Organizations are also in the unfortunate but understandable situation of having to utilize existing assets as well as investing in the right new technologies to realize big data scenarios. Nobody can just rip and replace everything in their data and IT Eco system starting from scratch. After all, you would not have much big data challenges if you don’t have already a ton of systems that collect or generate data. So, you probably want to maximize your existing investments and platforms while transitioning into this still new and emerging era. There is no doubt that in many cases the insight from big data provides even more power when related to your transactional SAP data. If you want to relate a customer comment on twitter to your CRM data and decide to react in seconds, if you have to collect smartmeter data by geo and relate it to plant profitability, or if you want to overlay weather, news, and traffic data to your logistics information to better tune your fleet routes in minutes, combining big data and transactional data is needed to realize such benefits. Albert Einstein said “make everything as simple as possible, but not simpler”. I love that principle – but how can you apply this to such a complex topic? I suggest to make everything simple wherever you can – things get complex on their own quickly. Let’s have a look at the broad requirements to see what we need. You need a system that can receive, process, and store data at extreme speeds (hundreds of Terabyte or more per hour) but you don’t want everything in memory to control cost. You need to process and store any kind of data type but don’t want to deploy a platform for each. You want to process structured SAP and unstructured any data but don’t want to design complex systems to achieve the same level of operational SLA across both. You want choice of your visualization tools and don’t know what you will prefer over time, which means you are looking for flexibility. You probably want to utilize existing data sources and you don’t want to migrate them all to the same location. And you want to utilize proven technologies you probably currently depend on for critical applications in your organization. 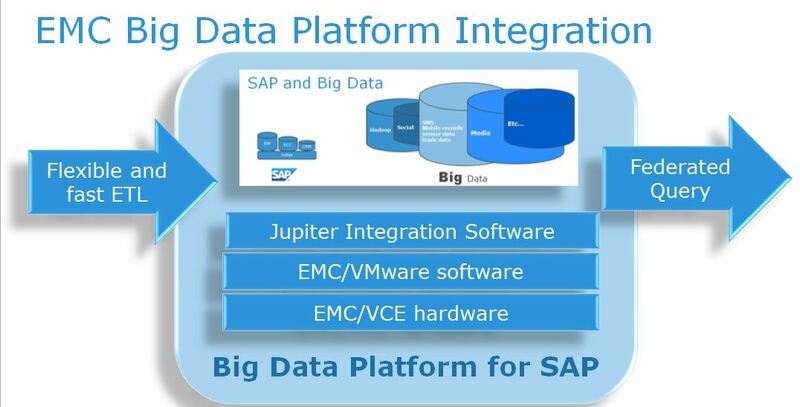 EMC’s big data platform for SAP adheres to all the above requirements and thereby simplifies big data projects. The platform also delivers on the principle of data temperatures. Same reason why SAP offers NLS and ILM for SAP-only data, right sizing Hana and deploying only hot data in memory while making cooler data available in less expensive platforms. We realize the same principle but from the big data angle (SAP untypical data). Storing data mostly in highly scalable and parallel SAPIQ, and replicate only required data in Hana based on the use case, and extend into Hadoop as well. It’s an amazing system that brings SAP and Big Data together. Visit the EMC booth #421 at SAPPHIRE Orlando this week (6/3 – 6/5 2014) to learn more.